Virtually every facility has at least one area where the floors put up with heavy loads, high impact or extreme abrasion. Without the proper industrial concrete floor systems, your concrete slab surface is liable to crack, buckle or deteriorate under these conditions, developing divots and fractures that necessitate more costly repairs down the line. 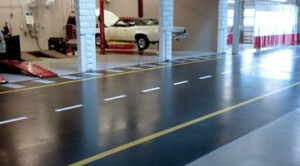 By installing one of our heavy duty epoxy flooring & coatings, you give your traffic surface the strength it needs to stand up to extreme pressure and heavy use. These industrial concrete floor systems help ensure that your slab is protected in harsh conditions, so you can stop worrying about the integrity of your flooring and get back to business. Your concrete slab is an integral part of your facility’s structure—it not only represents a substantial investment, but it provides the foundation for your entire space. 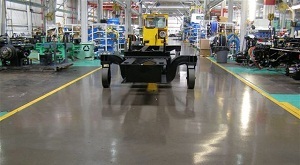 Choosing a light duty floor coating for a heavy duty environment puts that slab, your investment and your entire facility at risk. Typical concrete floor systems can’t always bear heavy loads or withstand severe abrasion and impact, and the slab underneath will still show signs of damage—this results in the need for costly, time-consuming flooring removal, concrete repairs and flooring re-application. Don’t take chances on epoxy flooring & coatings that may not be strong enough—trust the proven strength and durability of a Florock system. Few other industrial concrete floor systems offer this kind of heavy duty protection, particularly in the variety of resin technologies here at Florock. With our diverse line of different formulas, you get the options you want and the extreme environmental protection you need.